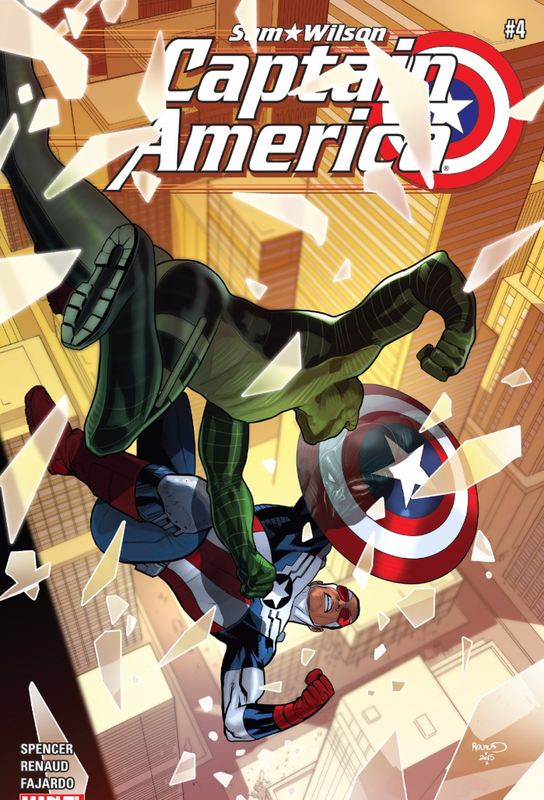 Sam-Cap-Wolf continues onward in the new chapter of this marvellous series by Nick Spencer, teaming up for this issue with guest artist Paul Renaud. Having been transformed by the wicked Dr. Malus into a flying lycanthrope last month, Sam Wilson is slowly adapting to his new form with only a few rage issues, some howling at the moon, and the occasional rummage through trash cans. Meanwhile, the jobber squad known as the Serpent Society have re-invented themselves as an evil corporate think-tank called Serpent Solutions and have hit Wall Street with a plan to control America where it matters: the executive boardroom. Sam consults with former member of the team (and former Steve Rogers flame) Diamondback to find out exactly what the serpentine gang is planning. Unfortunately, it turns into a setup, and Sam is captured and taken to a boardroom which contains… every single past member of the Serpent Squad! The humor continues in this issue, coming particularly from Sam in his wolf form– for example, in a throwaway panel in which he’s licking from a plate at a restaurant. A few panels of Viper in a full set of golf knickers and vest laughing with executives on a course is also absurdly perfect. It was also pleasing to see the appearance of Claire Temple, a fan favorite character you might recognize from the Marvel Netflix shows, as a new member of Cap’s team. There’s also a tease of who the next Falcon will be in a Hispanic bird-man named Joaquin Torres who was introduced last issue. If there’s a fault with the story this week it’s that there really doesn’t seem to be much for Misty Knight to do (D-Man doesn’t appear at all!). It would be great if she could accompany Cap on some missions as well. Maybe we could even have Misty Wolf-Knight! The art by Renaud is also sometimes inconsistent panel-to-panel, but the appearance of Cap’s wolf head is especially realistic, showing lots of teeth and animalistic qualities. The design of Diamondback is very much in line with her original neon purple 80s design but also doesn’t sexualize her as much as past appearances. She even has a great line about how women can finally breathe in their costumes again. All things considered, it’s a really fun book and uses its premise to the full extent, instead of just having it run for one issue. In turn, the book is the right blend of humor and relevancy in its portrayal of corporate America being literally run by a group of racist snake people. The Serpent Society have been forever known as a bunch of goons in the Cap mythology so it is awesome to see them here as a viable threat. Still, it’s nothing our Sam-Wolf can’t overcome!